The number of calories that you eat each day will depend on what your primary goal is (i.e. to gain muscle or losing bodyfat). 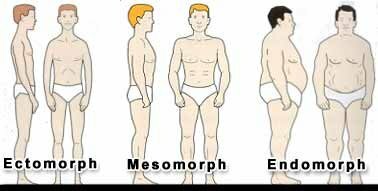 There are three distinct categories of the human body: the endomorph, characterized by a preponderance of bodyfat; the mesomorph, marked by a well-developed musculature; & the ectomorph, distinguished by a lack of either much fat or muscle tissue. The three body types are described below. Obviously, most people do not fit exactly in one category or another. We tend to have a combination of the 3 body types. For example, some people are thin & very lean (ectomorph). But others may be what I call “skinny fat”. They are thin, but still lack muscle definition & they have a high percentage of bodyfat. Some people are overweight with high levels of bodyfat & muscle mass (endomorphs), but there are also people who are overweight with high levels of bodyfat, but they do not have much muscle mass. If your primary goal is to gain additional muscle mass then you will follow the “Bulk Up” eating plan. If your primary goal is to lose excess bodyfat then you will follow the “Lean Gain/Fat Loss” eating plan. This eating plan is designed for those who have a low bodyfat percentage & are looking to build more muscle mass. Since your goal is to get bigger & build maximum muscle mass, you need to eat more protein. Extra protein will supply your body with the raw materials that it needs to add muscle tissue. Every gram of protein contains 4 calories. You should eat 1.2 grams of protein per pound of bodyweight each day. Eating extra carbs is vital in preventing protein from being wasted as an energy source. Using carbs for fuel will allow protein to do its main job, which is to repair & build muscle tissue. Every gram of carbohydrate contains 4 calories. You should eat 4 grams of carbohydrates per pound of bodyweight each day. Fat lubricates your joints, helps produce anabolic hormones, facilitates protein synthesis, & is used for energy. No diet is complete or healthy without proper fat intake. Every gram of fat contains 9 calories. You should eat 0.5 grams of fat per pound of bodyweight each day. Here is the daily Protein, Carbohydrate, & Fat intake for a 150 pound person. While following the “Bulk Up” eating plan you should eat 5-6 meals per day. Try to space your meals 3 hours apart. Remember these are just guidelines, everyone is different. After you follow these eating suggestions for a few weeks you may need to adjust your calories up or down in accordance to your body’s metabolism. This eating plan is designed for those who have excess bodyfat & are looking to lose fat while adding lean muscle. Adequate protein intake will keep your metabolism high, prevent muscle loss, & help your add lean muscle while you lose bodyfat. Every gram of protein contains 4 calories. You should eat 1 gram of protein per pound of bodyweight each day. You need to cut back on your carbohydrate intake in order to utilize stored bodyfat for energy. Every gram of carbohydrate contains 4 calories. You should eat 2 grams of carbohydrates per pound of bodyweight each day. You should eat 0.4 grams of fat per pound of bodyweight each day. While following the “Lean Gain/Fat Loss” eating plan you should eat 4-5 meals per day. Try to space your meals 3-4 hours apart.